The Nogworth Cross-base, Briercliffe, Lancashire. OS grid reference SD 8833 3408. The Nogworth Cross also called ‘The Northwood Cross’ is located to the north of Extwistle between Extwistle Hall and Monk Hall about 2 miles south-east of Briercliffe. What remains of the cross stands at the side of a country lane close to Shay Lane and Todmorden Road – having been moved here in 1909. Today only the roughly-hewn base remains, which is a slightly tapered block of sandstone about 3 feet 3 inches across and 20 inches high with a socketed recess at the top for the stump or shaft of a medieval cross – the shaft and cross-head having long since disappeared. The thinking being that this was a former market cross from the 14th-15th century? Or could it have been set-up by the monks of Whalley Abbey to mark the boundary of the land that they owned from the 13th-16th centuries? The Cistercian abbey at Whalley was founded in 1172 and dissolved in 1537. 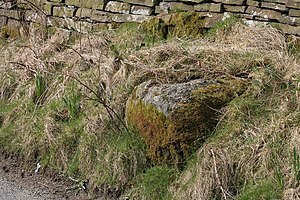 Many people walking along the country lane at Extwistle would now not even notice the lump of stone lying forgotten in the grass beside the wall, which is quite sad really. Beth Cross or perhaps ‘The Roggerham Cross’ remains largerly forgotten and lost to the mists of time. It was a flat piece of stone with a very faint incised Latin-style cross carved onto it. It’s location is not known, but it was said to have lain in the Holden Clough area about half a mile to the south-east of the Nogworth Cross. It was thought to mark the extent of the land, or the boundary, of the land owned by the small abbey of Newbo near Sedgebrook in Lincolnshire, which was a Premonstratensian foundation founded in 1198 but abandoned soon after 1401. But why did they hold land at Roggerham so far away from their religious house in Lincolnshire. This is something of a mystery. And to confuse things even more there was a ‘Dennis Cross’ and also a ‘Widdop Cross’ (site of) in the same area. Roggerham itself is a tiny hamlet along Todmorden road, Extwistle, to the east of Lee Green reservoir and is not even mentioned on the Os maps. The name ‘Beth Cross’ is a shortened form of Elizabeth’s Cross (maybe some association with St Elizabeth?). These wayside crosses were all surveyed by Mr Clifford Byrne in the late 1960s though his work was never published – he also did a survey of Holy Wells and Mineral Springs of North-East Lancashire. [Any further information on the Beth Cross or The Roggerham Cross would be very much appreciated]. The Briercliffe Society (Newsletter archive number 92 May 2007). 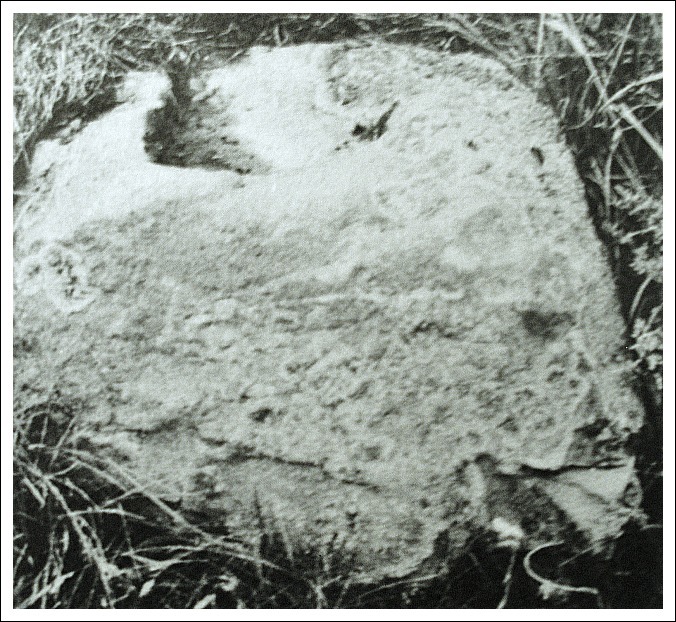 Byrne, Clifford., A Survey of the Ancient Wayside Crosses of North-East Lancashire, unpublished manuscript, 1974. Categories: Ancient Crosses, The Nogworth And Beth Crosses At Briercliffe In Lancashire | Tags: Ancient Crosses, The Nogworth And Beth Crosses near Briercliffe in Lancashire | Permalink.